Just another day on the highway. This review is pretty overdue I’ll admit. I’m sorry, but I completed this game shortly before I got hit in the face with final exam season. Despite its moniker, Grand Theft Auto V is NOT the fifth entry in the GTA franchise, but rather the seventh; I’m not sure why Vice City and San Andreas weren’t numbered. GTA V takes place in a reimagined Los Santos (a city that originally appeared in San Andreas) as you take control of no less than three, very different criminals trying to make names for themselves. In almost every way, I felt like GTA V was exactly the game I think GTA IV should have been. To me, GTA IV was a very impressive tech demo, but suffered from the fact that it had noticeably less content than the preceding games in the series. Even after having invested 40 hours into GTA V and having completed the story, I still have not seen all GTA V has to offer. The Grand Theft Auto series was always known for the sheer amount of freedom it offered the player in their gameworlds (see my retrospective), and GTA V does not disappoint in that regard. You have all sorts of diversions that can keep you occupied. You can do anything from simply playing a game of golf to taking part in a street race to going to a gun range to improve your current character’s shooting ability. RPG-like stats make a return from San Andreas, though I felt that they had much less of an impact on gameplay. 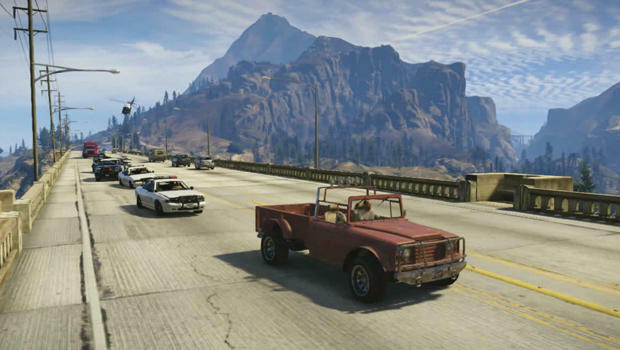 Even with Franklin, a character who starts off with a really high driving ability, I felt driving felt a tad floaty, and flying wasn’t really too easy even with Trevor, who was supposed to be the best pilot. Despite that, the activities you can take part in to improve your skills don’t remotely feel like a grind. The base action-adventure mechanics make a return from Red Dead Redemption. Everything from the controls to the weapon selection wheel is identical. Despite that, I will say the combat is a lot more challenging thanks to the enemy (particularly police) AI being much, much more aggressive than it was in Red Dead Redemption or in any past GTA title. For that reason, I say GTA V is the first game in the series that actually discourages you from starting your own random crime spree as the police represent a lethal force even at a two-star wanted level. Thankfully, missions never get too frustrating as they have ample checkpoints; past games would force you to start missions all over again when you fail them. I think I managed to complete most missions in this game under three attempts. Graphically, GTA V is probably one of the best-looking games I have played in recent memory. Los Santos and its surrounding areas are rendered in exquisite detail. When you take to the air in an aircraft, GTA V shows off its more than healthy draw distance. The lighting effects from the California-esque sunlight makes things like reflections on cars look like a real sight to behold. The three main characters were modeled after their voice actors, and it is almost eerie how similar the character models looked to their real-life counterparts. On the other hand, I will say GTA V, among the Rockstar titles I’ve played, had the weakest story. While being able to switch between three different characters on the fly was an interesting gameplay mechanic, the narrative really suffered as a result of none of the three leads getting adequate development. Franklin ultimately felt like a cheap CJ knock-off while many cutscenes devolved into screaming matches between Michael and Trevor. Ultimately, the story served little purpose besides giving the characters a reason to embark on the game’s heists. The heists were where GTA V really shined as you get to plan your heists before actually embarking on them. Most heists gave you the option of doing something sneaky or doing something dumb and loud. Even after selecting an option as to how you will go about carrying the heist out, you would then be tasked with preparing. For instance, one time I had to pick up a firetruck so I could disguise my crew as firemen to slip into a burning building. Finally, once the heists themselves take place, you are treated to some top-notch scripted action. Overall, GTA V is still the mature (As always, it has a very well-deserved M rating), free-spirited action we came to know and love from the Grand Theft Auto series. What the game lacked in story was more than made up for in its sheer size and gameplay. I would definitely say it’s one of the best games I’ve played recently.